Cause related marketing (CrM) has been increasingly becoming a mainstream of corporate marketing plans. The purpose of this study is to investigate the effect of CrM on attitudes and purchase intention and also the moderating role of cause involvement and skepticism (as covariates) on attitude-intention rationale. The study utilizes experimental design, using a convenience sample of 424 participants in Gujarat. Two structured questionnaire each for experimental group and control group were developed. The stimulus provided is in the form of brand name, product portfolio and CrM ad itself in the questionnaire for experimental group. Using Analysis of Covariance (ANCOVA), study demonstrates that CrM improves the attitude towards brand, attitude towards an ad and purchase intention. Additionally, effect of CrM on attitude-purchase intention link is more explained if consumers are more involved with cause. Skepticism is not relevant to attitudes and purchase intention. This study helps companies to rethink on selecting. It also provides the insights to marketers about how cause involvement influences attitudes and intention and thus adds some valuable theory to the CrM literature. Bigné-Alcañiz, E., Currás-Pérez, R., Ruiz-Mafé, C., & Sanz-Blas, S. (2011). 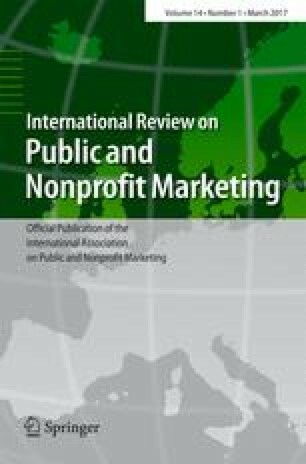 Cause related marketing influence on consumer response: the moderating effect of cause brand fit. Journal of Marketing Communications, iFirst. doi: 10.1080/13527266.2010.521358. Cone, Inc. (2006). Cone millennial cause study 2006. Available at: http://www.coneinc.com/content1090. Accessed on 15 Feb 2011.